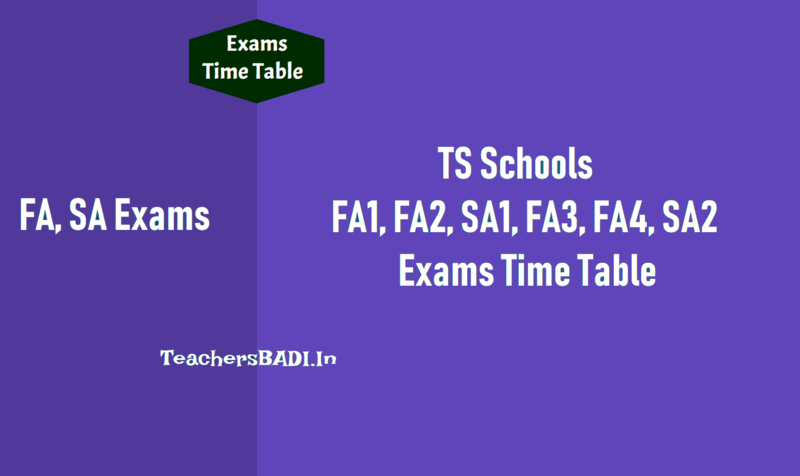 TS Schools Formative, Summative Assessment Exams Time Table: TS Schools Formative Assessment Summative Assessment Exams Time Table, FA1, FA2, FA3 and FA4,Exams Time Table, SA1 and SA2 Exams Time Table, Quarterly, Half yearly, Annual Exams Time Table:: The dates and months of various internal exams in Telangana Schools: The internal exams i.e. Formative Assessment (FA) scheduled At four times i.e. FA1, FA2, FA3 and FA4. Further two summative assessment have been scheduled. The dates and months of both internals that is Formative Assessment and summative examinations are given here under. Pre-final for Class X Before 28.02.2019.